What is the Local Food Movement? The idea of eating local food has really come into the spotlight recently, to the point that many refer to it as the "local food movement". What does that mean and why the interest? We have quickly become a society, a world actually, that believes the best approach to feeding ourselves is to mass produce our food as cheaply as possible, using few varieties of each food, growing them on massive agricultural plots and then shipping them worldwide. As consumers, we are quite used to eating strawberries in December and peaches in January while we look out over our snow covered yards. But are we paying the price for this convenience? Food researchers, economists, nutritionists and even spiritual teachers are beginning to answer - YES we are. I live in a region of Canada that is one of the few areas capable of growing sweet cherries and peaches, yet just last summer there was a story in our local news media about a farmer who was forced to cut down his entire orchard of cherry trees because there was no place to sell them in large quantities locally. There are no canning factories left here. I see peaches from Georgia on the shelves in our big-box grocery store chains in July and August, when local peaches are at their peak. Do I have something against the farmers in Georgia? No, of course not, but what about the farmers who live next to me? And what about the produce that we are consuming that has to withstand the rigors of long distance travel? There are many issues that result from the transportation of unripened produce thousands of miles to its consumption point - issues of nutrition, excess carbon "footprint" and economy. Local food certainly costs far less in transportation and energy costs to get it to market and therefore is much kinder to planet earth. Even the mind body spirit connection is affected by the food we eat and where it comes from. Locally grown produce is certainly fresher. It can often be picked within 24 hours of being served on your dinner table. The local food movement has gained a lot of impetus over the last few years. It has even spawned a new word - locavore. A "locavore" is a person whose diet is primarily focused on foods grown and produced nearby, usually seen as within a 100 mile radius. There has been a lot of press lately on large groups of people in whole towns following a strict local food diet, often referred to as the "100 Mile Diet", with varying degrees of success. The locavore movement encourages consumers to buy foods that are grown as close to home as possible, from farmers’ markets, farm stands, or pick your own operations. There is a greater interest as well in home gardens and community gardening. Some municipalities are even allowing urban chicken coops, with the idea that people should be allowed and encouraged to produce as much of their own food as possible. I am not talking about following a 100 mile diet to the exclusion of all else. Most of us won't go that far. But if we are more conscious of where our food comes from and try whenever possible to choose local food, we will be amazed at the differences it can make in our community, our bodies and our world. 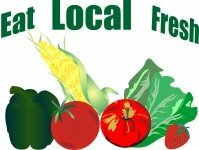 Look here for more detail on all the reasons it makes sense to eat local as often as you can. 1. Get to know your area. If you don't already know, learn what grows in your area and where you can buy it. Source out the farmers markets, farm stands, cooperatives and farmers that you can buy from directly. I recently found out, for example, that I can buy grain fed beef directly from a local farmer for very reasonable prices, all cut and packaged as it would be in my big box grocery store. 2. See if there is a CSA (Community Supported Agriculture) program where you live. What that means is that you make an agreement directly with a CSA farmer that you will buy a box of fresh seasonal produce (usually organic produce) from them each week or biweekly. You get what's in season, fresh picked from the farm and the farmers are guaranteed sales of their produce. Perfect! 3. Start your own small garden. Dig up even a small patch of garden or use containers and get planting. Tomatoes, green and yellow beans, peppers and herbs are the perfect way to put your toe in the water and start gardening. Talk about local food! 4. Some of the big box stores are really making an effort to bring local food into their stores. Look for signs in your grocery store that indicate the produce is grown locally. The movement is beginning to be so strong that I am noticing signs in the store or in the store's weekly ads that indicate food that is "grown close to home" or in my case, sometimes "grown in Niagara". Make a point of choosing the local food whenever possible. Find out more about the benefits of eating local. Go from local food to our home page and start browsing for more info.